This route is one of the most popular routes for many tourists who wish to start their ascent into the mountains from the north-western part of the Ukrainian Carpathians. The mountain top Polonyna Runa represents a huge plateau, covered with bushes of blueberries, cranberries, lichens and dwarf mountain pine. Half of the route runs along the wooded slopes. At the top you can find the remains of the former military object – a radar station of far observation. There are memorial steles in honor of the partisan movement during the Second World War. To the top a concrete road is paved, allowing to reach it even by a car. However, our route is a pedestrian version of the ascent, described in some old guidebooks. 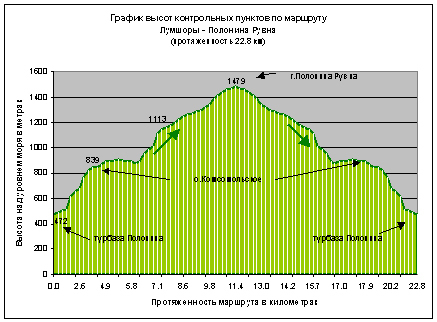 This route starts from the tourist centre “Polonyna”, located at the end of the village Lumshory, Perechyn area. You can get to the centre by shuttle bus Perechyn-Lumshory. From village you need to go no more than a kilometer along the road leading to the tourist centre, in the direction of the North-East. The tourist centre can be reached in the following way. From Uzhgorod drive out to the bypass of M 06 and E 50, roll on the road T 14 03, which leads to the town of Perechyn. In Perechin take the road T 07 12 in the direction of Polyana village. At the 8-th kilometer, in the village of Turia-Remeta, turn aside the villages Turichky, Lumshory, road T 07 23. Next on the 7 th. kilometre from the turn, go left, in the direction of the village Lumshory. From the side of Lviv, Mukachevo you need to drive in the village of Polyana that is close to the town of Svalyava, and in the center of the village roll the pointer – Perechyn. At the hostel there is enough space to park the car without any problems. The trail to polonyna starts immediately behind the camp. We pass onto the left bank of the creek by a suspension bridge, go around the wooden building and move in a southerly direction (189 °). Immediately the ascent starts. After 0.5 km. we cross a small area with abandoned foundations and turn left at the rate of 88 °. After passing 150 meters we come to a forest road and continue moving to the South. Making a small zigzag, we continue to move in a westerly direction (a little over 700 meters). The road turns up in the South, crossing a small wooden bridge and changes the direction to the south-east (134 °). Passing 300 meters from the bridge, we come to the meadow (650 metres above sea level). The next 370 meters are passing at the rate of 65 °, in the direction to the east, then 490m. at the rate of 161 °, then 650 m. towards the north (29 °). Soon the forest the road comes to a large meadow at the bottom of which there is a small lake (839 metres above sea level). On minded, the lake was named Lake Komsmolske. At this point, many tourists make a break, stopping for the night, organize summer camps. The southern part of the field several buildings with facilities for tourists are built: a wooden house, decks for tents, tables. Nearby there is a spring where you can replenish water supplies. From here to the summit of Mount Polonyna it is 7.1 km and about 3 hours of walk. Vertical drop is 640 meters. We continue our journey. From the lake, past the stone block, the trail goes first to the South (186 °), after 0.6 km. crosses the creek, and after 0.4 km. overlooks the large open field. Passing the field road in a southerly direction 650 metres to the fork in the road, we turn left to the North-East and further we are moving at the rate of 22 ° -25 °. 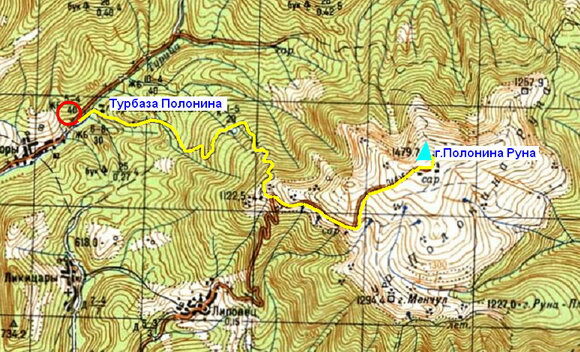 From the crotch to the top plateau of the mountain Polonyna Runa we will rise to 220 meters vertically and pass 1.24 km. The first objects on polonyna which tourists find are the ruins of buildings and remains of concrete foundations. We pass Metro300 up to the concrete road. Further, this concrete road leaves to the South, then to the Northeast and in the end leads us almost to the top of the mountain Polonyna Runa. Here, at the very top, you will find a huge construction ruins of the former Strategic object. It can take hours to become acquainted with the remains of iron and concrete. However, it is much nicer to enjoy the limitless panoramic expanse of valleys, canyons, mountain ranges, diverging like a fan into different sides of the horizon. In the north the mountain peaks of the mount Ostra are visible (1.405 metres above sea level), to the right of it Pikuy (1.406 metres above sea level). In the East the Reserve Shypot stretches. To the South lies Turyanskaya Valley. 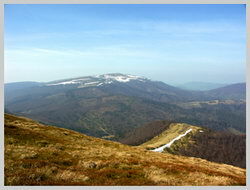 In the North-West, at the distance of “extended hand”, two peaks Mala Golytsia (1.183 metres above sea level) , and Lutanska Golytsia (1.374 masl) are seen. In the West Slovenske Beskydy are visible . Descent to the camp will be no less interesting than the ascent. Down there for enjoyment of tourists there are a swimming pool, mineral baths, cold mountain waterfalls.